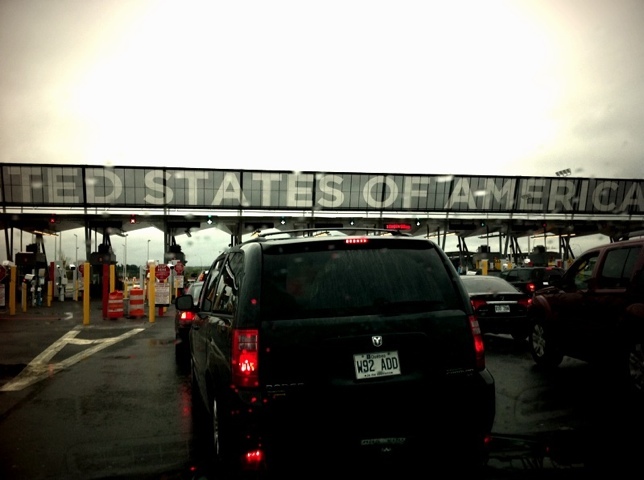 Not the song, nor the city per se, but we did find ourselves pulling up to the US border at around 11.00 a.m. this morning and it had not been in the plans the night before. Let me back up a second. Last week was Mother’s Day in North America and we spent the whole week painting our bedroom and bathroom. An enormous project that bled right into the following week, we had made the decision that we would postpone any Mother’s Day celebrations until all the work was done. So this weekend was the one. Sunday was to be all about Marie. Breakfast in bed was followed by a selection of presents and cards which was followed by a pause. I knew something was coming, I just could not quite put my finger on what. And then it came. “Let’s go to Plattsburgh!” So we did. Within an hour we were at the border, passports at the ready and an eagerness normally reserved by a hungry dog when he senses his dinner is being prepared. The experience with customs was without a doubt the most pleasant that any of us have ever had. We were actually treated to a smile which momentarily threw us off. For a brief second all those spy books you read as a child come flooding back and you suspect that this is some covert tactic to get you to drop your guard and admit that you are smuggling three Canadian grown apples into the US, but then just as quickly we realised that may be this was just a nice bloke trying to make an otherwise stressful job a little more pleasant. Well done! We go to Plattsburgh for one reason, shopping. No wait, make that two reasons. Panera Bread as well. What an awesome place for lunch that is. But shopping is the number one concern and it’s all about Target and groceries. Not at the same time necessarily but we don’t have Target in Canada yet and so it’s a real treat to shop there and of course whenever you’re in a country other than your own you have to go and stock up on edible goodies that are native to the area. Of course not everything is meant to be consumed by humans but we could not resist this jiggly package of dog gravy and imagine who the genius was who came up with that one. Were they watching their poor mutt try and choke down a bowl of dry kibble one afternoon and suddenly thought “That dog needs some lube. 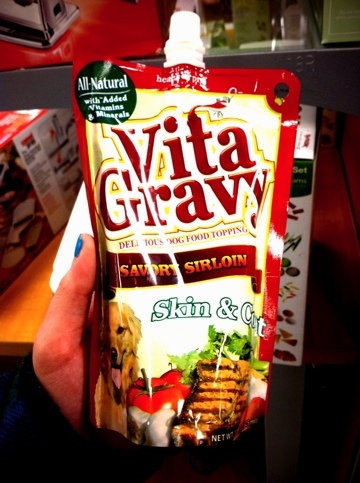 I am going to market dog gravy!” Well, whoever it was has the last laugh because there it is on the shelf, and until I can come up with something better to compete with it I have no right to judge. 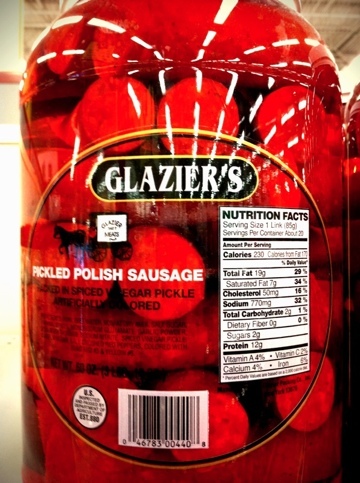 As is usual, everything is big in the US, and I could not imagine trying to force down this entire tin of gnarly looking baked beans in one sitting let alone a week. 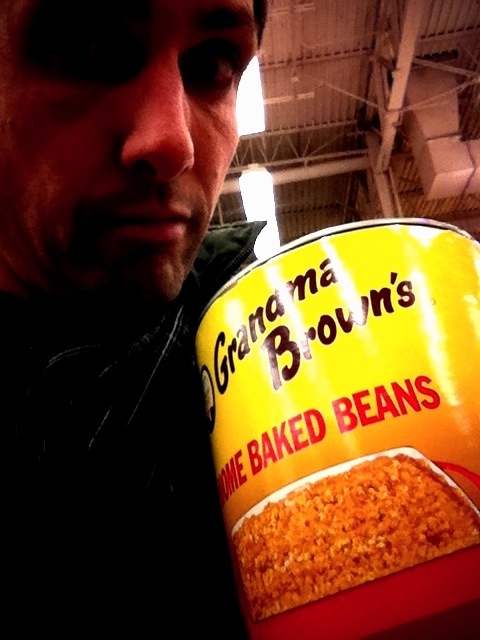 Perhaps a large jar of some sort of sausage packed in god knows what would go well with the beans? I didn’t want to find out so we moved right along, but four stops later we had the car boot chock-a-block with all sorts of groceries, much of it impossible to combine into anything that would resemble a meal, but of all of it completely necessary to our survival. You have no choice but to simply keep telling yourself that you only do this trip a couple of times a year so really you’re saving money. Amazing what you can convince yourself of sometimes! We rolled back into town before dinner and let the dogs out, their excited and slightly cross-legged dance of joy when they saw us only cut short by the urgent need to get into the back yard. A long, exhausting day, but terrific fun. Where are we going to go next?